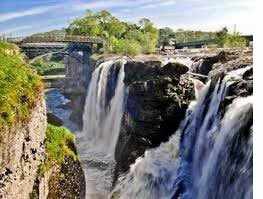 (17/P5) TRENTON – Department of Environmental Protection Commissioner Bob Martin today announced that the Green Acres Program has purchased a tract of land near the Paterson Great Falls National Historical Park to preserve the viewshed and support visitation to this important landmark. The 8.5-acre site sits upon a dramatic ridge that rises more than 100 feet above the Passaic River, and offers an excellent view of Paterson’s Historic District below and the New York City skyline in the distance. 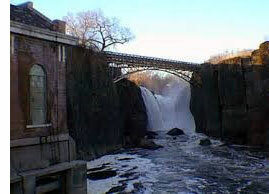 The property is adjacent to Paterson Great Falls National Historical Park; partially within the National Historic Landmark district, and adjacent to the Great Falls of Paterson-Garret Mountain National Natural Monument. Preservation of this property provides the opportunity for an expanded trail system, historic interpretation and other park amenities. The Green Acres Program purchased the property from Paterson Renewal Associates, LLC for $5.7 million. The land, once slated for a housing development, contains a parking lot that will be used to support public access. DEP will partner with the City of Paterson regarding improvements to and management of the property. In 1791, Secretary Hamilton helped found the Society for the Establishment of Useful Manufactures (S.U.M. ), a state-chartered private corporation to fulfill this vision. Paterson itself was founded by the Society that same year and it chose to name the new town after New Jersey Governor William Paterson – a signer of the Constitution and, later, an Associate Justice of the United States Supreme Court – in appreciation of his efforts to promote the society.